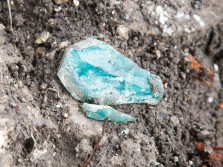 Raw glass found at the antiquities site. Photo by Assaf Peretz, courtesy of Israel Antiquities Authority. Centuries before the Land of Israel was a hub for the high-tech industry, the region was among the world leaders in another profession involving science, skill, and specialized knowledge: glass making. The Israel Antiquities Authority (IAA) announced in a press release on Monday that they have discovered 1,600-year-old kilns used for making commercial quantities of glass. The Authority said that the find, the oldest glass kilns ever found in Israel, show the Land of Israel during the late Roman period was “one of the foremost centers for glass production in the ancient world.” And that ancient global trade route looks to have gone all the way to Europe. “This is evidence that Israel constituted a production center on an international scale; hence its glassware was widely distributed throughout the Mediterranean and Europe,” glass expert Professor Ian Freestone of the University College London was quoted as saying in the IAA press release. One of the key elements of making glass is sand, and it turns out that the ancient Land of Israel had some of the best for that purpose. “We know from historical sources dating to the Roman period that the Valley of ‘Akko was renowned for the excellent quality sand located there, which was highly suitable for the manufacture of glass,” said Yael Gorin-Rosen, head curator of the Israel Antiquities Authority Glass Department in the press release. The glass production site was uncovered by an antiquities inspector during work for a railroad from the coastal city of Haifa. The IAA inspector, Abdel Al-Salam Sa‘id, stopped the railroad construction when he saw chunks of glass and a floor in a trench. They ultimately found bricks from the kilns as well as the glass and floor. The process for making glass in the kilns involved loading clean sand and salt into the kilns—a type of oven used in the process—that were then heated to over 2,100 degrees Fahrenheit (1,200 degrees centigrade). That melted the ingredients together, which eventually formed massive chunks of glass that could weigh more than 10 ten tons. After cooling, the blocks of glass were chipped into smaller, more usable pieces that could be shipped in the raw glass trade where they would be re-melted for use in making glassware.